30 kph has been proven to work in theory and in practice. Let’s make it a European priority to limit speeds in our cities. The European Cyclists´ Federation has been supporting and will continue to support the 30 kph citizens’ initiative (available here). The initiative seeks to force the European Commission to looking into the possibility of making 30 kph the default speed in urban areas. There are many reasons why we are doing this and why, along with many other organisations across Europe, we support such a scheme. Currently road speeds in European built-up urban areas are limited to around 50 kph though of course there are many exceptions where limits are lower. 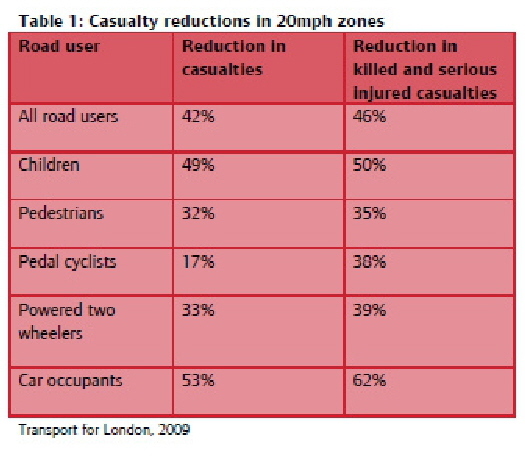 Recent analysis of cycle deaths in London found that virtually all fatal collisions occurred on roads with a speed limit of 48kph (30mph) or higher1. Excessive speed is a direct factor in about a fifth of all collisions and is a major contributory factor in a third of all road deaths. A Norwegian study3 has shown that a 10% reduction in the mean speed of traffic will result in a 37.8% reduction of the number of fatalities. Looking specifically at one city Graz is the perfect example. Graz was the first city in Europe that introduced a city wide 30 kph zone. Around 800 km’s of a total 1000 km’s of city streets have been calmed5. The results? After the first 6 months there was a 24% reduction in serious accidents. But what is also interesting is that the city had an increase in cycling and other active forms of transport. Strong enforcement and implementation of 30 kph was important for this to work but seems to have provided real beneficial results without resorting to more expensive infrastructure. If the roads are free of fast moving traffic then this encourages more cyclists to get on their bikes while also providing a safer environment. The perception of risk was decreased as was the actual risk, both essential for cycling promotion. This will become more important in how we find new and better ways to provide citizens with more liveable and sustainable cities and living environments. Our transport systems are and are going to play a pivotal role in this. It is our transport systems that are the biggest threat to our lives within urban areas. More than crime or fire or industrial accidents and yet it is also our transport systems that we depend on for everyday living.